FourFreedomsBlog - Point and Spin. Obama was greeted by Brewer soon after Air Force One landed in Phoenix this afternoon. The president was handed a handwritten letter by Brewer, and they spoke intensely for a few minutes, according to a White House pool report. At one point, she was pointing her finger at him and at another, they were talking at the same time, seemingly over each other, according to pooler Carrie Buddof Brown of Politico. I'll be back with something worth talking about. 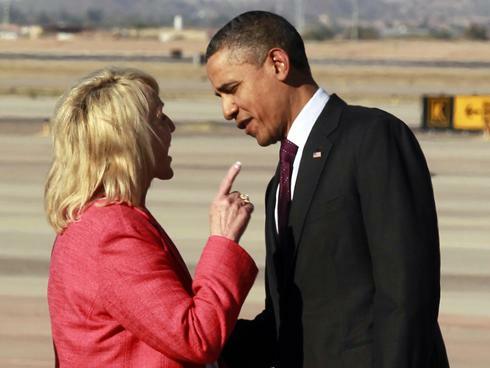 In the meantime, Jan Brewer can keep spinning that she was intimidated by the President. Guaranteed.